Buying a special bottle of wine to save for an anniversary, big birthday or family celebration is a fun idea – but the latest research suggests that unless the bottle is stored in cellar conditions it might not be worth drinking when the big day comes. Wine kept in a cupboard at home ages four times as quickly as that stored in a wine cooler – so people buying premier cru wines without facilities to store the bottles properly may be wasting their money. Dr Fulvio Mattivi who led a study at the Edmund Mach Foundation wine academy in Trentino, Italy said, “people think, this is the year my child was born, I will buy a bottle and save it for ages. It is not a good idea.” The study showed that even slight variations in temperature are enough to alter the quality of wine. The researchers stored 200 bottles of Tuscan red in a professional cellar between 15-17°C (the temperature range available on CDA’s range of wine coolers) and another 200 in domestic conditions between 20 and 27°C. After 2 years the wine stored in domestic conditions had aged faster and had a poorer flavour than the wine stored in cellar conditions. The authors of the report suggested that people who don’t live in a house with a cool cellar could invest in a wine cooler. ”For 30 bottles you can get something small, around the size of a washing machine,” said Dr Matti. 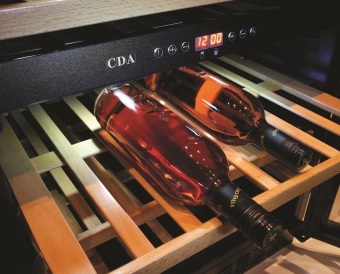 CDA offers an extensive collection of freestanding and built in wine coolers. The fwc623 will hold 40 bottles and can be set for different temperatures in the right and left zones – so both reds and whites can be kept in perfect conditions. 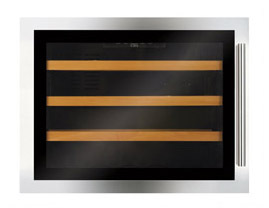 It has professional style wooden slide out shelves, electronic temperature control, UV protected smoked toughened glass doors, LED interior lighting, temperature memory function, over temperature alarm, 2 humidifiers so the corks can’t dry out and the temperature range in each zone is 5-22°C.